Charlotte Mackintosh is an internationally known bestselling romance writer who has no romance, and remains a mystery to her fans. In fact, she has little in her life besides her work, her pampered cats, and her secluded home off the coast of Washington. And then there is her very best friend, Bridget, who lives in Scotland, where Charlotte lived until she was fifteen. Bridget, whom Charlotte hasn’t seen in twenty years, but continues to write to—though the replies have stopped. Hurt by the silence, an opportunity arises to find answers—and maybe much more. Charlotte must finally return to Scotland to sell her late father’s cottage. It was his tragic death when Charlotte was fifteen that began her growing isolation, and the task is fraught with memories. But her plans are slowed when she’s confronted with the beautiful but neglected house, the irresistible garden—and Toran, Bridget’s brother. Capable and kind, Toran has the answers Charlotte seeks. And as she is drawn deeper into the community she thought she’d left behind, Charlotte learns not only more about her dear friend, but about herself—and discovers a new and unexpected path. It’s taken me a few weeks after I received this book to finish it, and even though it had a slow start, I’m glad that I stuck with it. A tale about true friendship from the perspective of an adult; this book is fun, sad, and full of characters that draw you in with their real life tales, and real life problems. 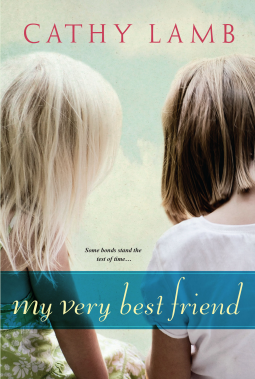 I haven’t read any of Cathy Lamb’s books before reading My Very Best Friend, and I suppose that was a good thing as I was able to enjoy a book that isn’t normally on my radar in a way that I maybe wouldn’t have had I known anything about the writer. The meat and potatoes of the book was the bond and friendship between two women, and the pain that they have both experienced unbeknownst to the other. Love, and friendship in its many ways is a strong and very central part to the book and is tied in to basically all the characters in their connections with each other. I really like that. The protagonist is a bit of an enigma and I find myself stuck between really liking her, and thinking she is just a tad bit too odd to be quirky. Overall her heart is in the right place, and that’s what makes this story so special – the love that circulates through this community despite the hate that also tries to take over. Without each and every character and their raw emotions the story wouldn’t have become what it was. That being said, the secondary characters are by far my favourite! I found this book to be a bit too wordy, and felt that it detracted from the story, as it could have been just as good, and just as relatable without the characters going off on a tangent. Based on what I’ve read this seems to be Cathy Lamb’s writing style, and if that’s her trademark then I feel that it’s something that you have to push through to enjoy the stories. There are parts of the book that made me want to put it down for good, and I found some of the “scenes” unnecessary, as well as maybe a tad infantile. I can understand why they were included, as it shows the bond between the characters, but for me it was a bit too much of a regression to school days. My favourite part was how delicately she touched on the very serious subject matter at hand. I was fascinated with how abruptly, yet seamlessly the skeletons came out of the cupboard, and was truly touched with every sad, and shocking twist. I don’t know precisely how I feel about this book. It certainly made me feel like I was a fly on the wall in these people’s lives as a whole, but I didn’t connect with them wholeheartedly. I suppose that whilst Charlotte found herself at home, I, on the other hand was the outsider.